A daily writing habit is thing number one because it is that important. Move your story forward by even a few words every single day, and you’ll be surprised by what happens. Or maybe not, since what will happen is that you’ll write a book. Twyla Tharp’s The Creative Habit is a great guide to help you create your daily writing habit. Stephen King says in his book On Writing that if you don’t have the time to read, then you don’t have the time or tools to write. He’s right. Make it a habit to carry a book with you. Keep one in your bathroom. Learn to read in sips instead of gulps so that not having hours to indulge won’t keep you from reading at all. And when you read, read like a writer. Pay attention to what works and what doesn’t. Read craft books. Read fiction that does what you want your stories to do. Figure out what works, what doesn’t, and — most important — why. 3. Watch TV like a writer. I’ve written before about my absolute belief that if you want to be a writer, you need to be watching television. I still believe it. Some of the best writing and storytelling is happening on television. Just like with reading, watch like a writer. Pay attention to what makes you like a show — why you’re willing to invest hours of your life in it. Or pay attention to why you’re not investing anything in it if you turn it off and never come back. 4. Watch movies like a writer. Ray Bradbury advised people who want to be writers to watch a lot of movies, particularly old movies. I go to the movie theater at least once a week. ($5 Tuesdays!) Writers should be story junkies, and a movie is a way to get an entire story in two hours. Pay attention to the structure, how it’s paced, and what parts worked for you or didn’t. 5. Set up your space. You need a place where your brain instantly knows it’s writing time. For me, it’s a corner of my den, right off the kitchen. I wish I had a whole room, but I don’t. I’ve lived in apartments so small and full of people that my writing place was a lap desk I used while sitting on my bed, and that’s okay too. So is your kitchen table or Starbucks or the library or a cooperative workspace or an office. Wherever it is, train your brain to shift into writer mode when you are there. Being around other writers will help you internalize the idea that you’re one, too. Seek out other writers. They’re your people. Find them online (come be a Ninja Writer), at conferences, in classes, or through an in-person writing group. Being around other writers will help you internalize the idea that you’re one too. 7. Write for one reader. The inverse of finding your tribe is this: Don’t try to write for them. Writing for a whole group of people is wildly distracting. Writing and reading are too subjective for that. Pick a person — just one — and write for them. If they like what you’ve written, then that’s good enough. You’ve done your job. You can get other opinions or use other beta readers, but contradictory advice can be filtered out. 8. Set boundaries with your friends and family. Your writing is important. It’s your job, even if you’re months or years from any tangible proof that other people will understand. Set your writing schedule, and then protect it like you’d protect any other work schedule. It’s okay to say no to interruptions. If writing is your job, you’ll do a few things: You’ll invest time in it. You’ll put effort into learning to do it well. You’ll finish what you start. You’ll expect other people to respect your work. Do all of that. 10. Write with the door closed. Your tribe is important enough that it gets its own item on this list, but your story is yours until you’re ready for readers. Only then does it becomes theirs. Don’t let it be theirs until you’re done with it. Keep writing. You’ll see the momentum pick up. Self-editing is as important as writing. You have to learn to do it. If you have the thought in your mind that you don’t need to have good spelling or grammar or comma usage because that’s what editors are for, banish it right now. If you’re going the traditional route, you’ll never get close to an editor without a clean manuscript. If you’re going indie, then you will have to pay someone to be your editor. You’ll save money and time and embarrassment if you turn in a clean copy to your editor (who, remember, you’re paying). Self-Editing for Fiction Writers by Renni Browne and Dave King is an excellent place to start. 12. If you’re an indie author, invest in editing and cover art. This is non-negotiable. If you wouldn’t be okay with a big publishing company releasing your novel with just your best friend’s edits and your own homemade cover, then you can’t be okay with it either. Self-publishing means you effectively are a professional publisher. And it means you need to hire professionals to edit, design your book’s cover, and if you don’t know how, to design the book itself as well. 13. Ship out your book — a lot. It’s very rare for someone to write just one book and have it be something that looks like a career. Don’t talk to me about Harper Lee or Margaret Mitchell. They’re unicorns. Maybe you’re a unicorn, too, but the chances are about 99.99 percent that you’re like the rest of us. And that means you have to keep writing and keep sending your book out into the world. 14. Give your career 10 books. Get yourself a calendar. Set your teeny, tiny goal. Meet your goal. Give yourself a gold star on your calendar. 16. Set teeny, tiny goals. I write about this a lot. Teeny, tiny goals are life-changers. You can get anywhere if you take one little step at a time. So set a goal that is so small — it’s harder to skip it than to just do it. My go-to is 10 minutes: Write 10 minutes a day; read 10 minutes a day. I even have a framework for it. 17. Give yourself gold stars. This is one of the most simple and simply effective things ever. It works for everyone, from kindergarten up. Get yourself a calendar. Set your teeny, tiny goal. Meet your goal. Give yourself a gold star on your calendar. (Or, if you’re way too cool for stars, get a Sharpie and give yourself a nice big X.) A visual representation of a string of successes will push you toward maintaining the streak. Here’s what I use. I call it FRED. 18. Call yourself a writer. Just trust me and say this out loud today: “I am a writer.” And the next time someone asks you what you do, say “I am a writer.” If you’re writing every day, you’re a writer. You’re allowed to own that. I don’t care what your day job is. Start identifying as a writer. It’ll be hard at first if you’ve never done it before, but you’ll get used to it. This one is important: There isn’t a whole lot you can do toward becoming a writer if you don’t finish a manuscript. Your writer brain will throw up shiny new ideas when the going gets rough on your work-in-progress. Write them down, but stay focused on your story. Remember when it was your shiny new idea and keep writing. Get all the way to the end. I wish so much that when my first books were picked up by a big publisher, they’d taken the time to tell me I needed to build an audience. 20. Make your day job serve your art. This is a shift in thinking that could change everything for you. Start thinking about your day job as something you do in service of your writing. Your nine-to-five pays the bills for you to write. It gives you those pennies you need for an editor and cover designer. 21. Build an email list. I wish so much that when my first books were picked up by a big publisher, they’d taken the time to tell me I needed to build an audience. An email list is so very important for a writer. Start now. Even if you’ve never written a book. Start writing on Medium or on your own blog. Publish something once a week and put something like Upscribe at the bottom. 22. Make a 5-year plan. You will really need to break it down. Write down goals for where you want your writing career to be in three months, six months, one year, three years, and then five years. Think of each of them as stepping stones. It’s much easier to put energy into accomplishing something like, “Write three short stories and have 50 people on my email list in three months” than to think only about some huge end goal. 23. Keep an editorial calendar. An editorial calendar is a simple tool that will help you stay on track as you move through your five-year plan. When I was a newspaper reporter, an editorial calendar was absolutely essential to my job. I never lost the taste for having one. I prefer to keep an analog editorial calendar. You can keep one online too. Just make deadlines for yourself and keep track of your writing goals. I use FRED to manage my novel writing. I keep track of my word count and have a daily log of my work. FRED is the most effective accountability partner I’ve ever had. 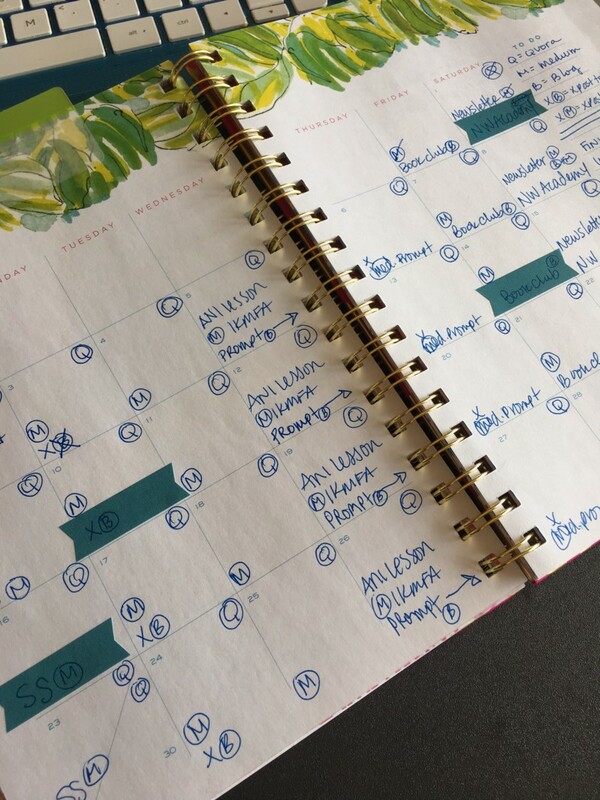 I use a monthly planner for nonfiction writing, which is mainly blog posts and Medium posts. I write the site for the post in a circle and cross it when I’m done. I don’t personally need to write in the titles of my posts or plan which post I’m going to write ahead of time, so I don’t. I do track some things weekly, like which posts I crossposted to my blog or to Medium so that I’m less likely to accidentally duplicate. I also keep a running list of story ideas in my editorial calendar. I see a lot of newbie fiction writers make this mistake, especially if they’ve just signed with an agent or sold a manuscript. They dive into social media with a hard focus on their fiction writing. If you’re not a unicorn, no one cares about your writing process. That goes for me too. Instead of tweeting #AmWriting and blogging about your cover reveal, write about yourself. Let your readers know who you are outside of writing. Write about the most interesting parts of yourself. Are you a pilot? Do you love deep-sea diving? Have you traveled all over Asia on foot? Whatever it is that you’ve done or that you’re interested in or an expert in, write about that. And if you think you don’t have something that makes you interesting, learn something interesting and bring other people along for the ride. I started this list telling you to write every day. I’m going to end in the same place. None of the other suggestions here can replace a daily writing habit. Write every day and finish your manuscripts. All the rest is gravy.